Bright Hope Word partners with Gershom Kasongo in his work as a leader responsible for more than 20 churches, CEO of Beracah Orphan Care and project manager of KERO farm. The financial support provided helps supplement his income as a farmer, releasing him to work effectively in reaching a community affected by spiritual darkness, poverty and disease. 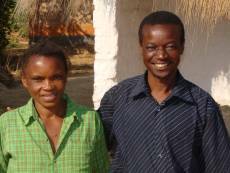 Since the 1980's Gershom and Jenipher Kasongo have been serving the Lord in the Mushota area of Zambia. They have given their life to this area of the country and have planted more than 20 churches in the Kawambwa area. Gershom and Jenipher have a real heart for people and desire to not only care for them spiritually but in a physical way as well. Many children orphaned through the HIV/AIDS epidemic are sent to the area however there are few opportunities for them, little infrastructure and no government support. Most who live there are poor farmers who struggle to take care of these orphaned children. Gershom and Jenipher are not only busy church planting and leading a number of churches but they have also established Beracah Orphan Care (ZAM01e) which cares for close to 200 orphans and KERO farm (ZAM01c) which not only provides employment for local people but also helps support the orphans. BHW first met Gershom in 2001 at a conference and after visiting him and seeing the work he was doing were excited about the opportunity to partner with him and financially support him as he and his wife seek to be agents of change in their community. This partnership provides personal support for Gershom and Jenipher so they can continue to be involved in a full-time capacity in the various aspects of their ministry without needing to also provide an income for themselves. Gershom's many responsibilities significantly compromise his ability to farm for himself. There are a number of very positive aspects to this partnership. Gershom has proved himself as a hard worker and leader over many years. He would be doing this work even if there was no support. As well as being a church planter, Gershom is an entrepreneur and is constantly seeking to find solutions to the desperate needs of his people. He has a holistic approach, seeking to cater for the spiritual, educational, relational, health and development issues that are presented in this community. He is a man of integrity and commitment with vision and a drive to see things achieved. 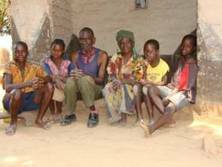 Gershom and Jenipher have eight children, some of whom are adults, two of which have been lost to local sicknesses. Gershom was trained at GLO Zambia in 1986 and since then has been passionate about reaching the lost for Christ. Prior to going to GLO Gershom had a good job in an urban area as a bus driver but left that and shifted his family to this poor rural area. Gershom has been responsible for establishing Beracah Orphan Care and KERO Farms and has developed teams of people to help lead these ministries. The strategy here is to continue to support this key couple as they work in their community and seek to bring change and transformation to people's lives. By providing them with the finances required to support themselves they are freed up to continue their work amongst the people in their community. KERO Farm (ZAM01c) which Gershom established is now able to financially support Gershom and his family so we no longer send them any support. In 2007 Bright Hope World gave Gershom a one-off loan of $US800 in addition to his regular support to assist him to set up a small shop in Kawambwa town to help provide the funds required for him to send his youngest children to school. Mary sat in the grass about 25 metres away as her mother and brother were interviewed. Mother Rosemary was very distressed. She had borne 5 children and Mary and her brother Albert were the only two left alive. Albert was not in the programme, he is 17 years old and in grade 5, many of the other children in his grade were 11 or 12 years old. Albert, who is not on the programme and Mary who is, are not orphans really, their mother is alive. But they are vulnerable, very, very vulnerable. Mary was still sitting in the grass; in fact she was now further away, staring at us like a wild animal. Mary is crazy, that’s what the family said. She tears her clothes off and runs around the village naked. 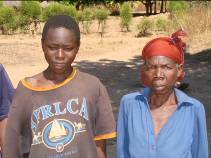 She is 13 years old and this is becoming a huge problem for the family and the village. It’s kind of scary, her future. She doesn’t go to school but is on the programme so the family can be helped. They get some soap and received a blanket recently, it’s the cold season. The Catholic Church she goes to helps a little as do some of the extended family, but it’s not much. The word suffering came up a lot in this conversation, some of it was physical; much of it was emotional. Rosemary has a small field that she tills but it doesn’t produce much and she has to constantly keep an eye out for Mary, by now she was 40 metres away and had disappeared into the long grass. Benson lives with his grandparents and three other siblings plus some other cousins. This is almost a typical family in rural Zambia now, grandparents caring for their grandchildren, the productive age dying out. How does this little old lady, Teresa Kabanda and her little old husband, Stephen Chansa care for all these children? What energy do they have to provide for them? Apart from loving them, what can they do? Benson is 15 years old and is in grade 8. He likes going to school and really appreciates that Beracah pays for his school fees but what can he look forward to? From time to time he gets some soap and Vaseline. The other children in the family, Richard, Abraham and Precious are not on the programme. These three and hundreds more could be added if the resources were available. His grandparents are very thankful for and impressed by the assistance they get to send Benson to school. But they are old and tired, the weariness is seen in their eyes and slumped shoulders. At the macro level, this family is typical and their situation begs the question, what happens to kids like this when the grandparents are dead? At the micro level there are some very tired, old, hungry people doing the role their children should have done.